The App is at release 2.1. This version adds support for macOS Mojave and Dark Mode. 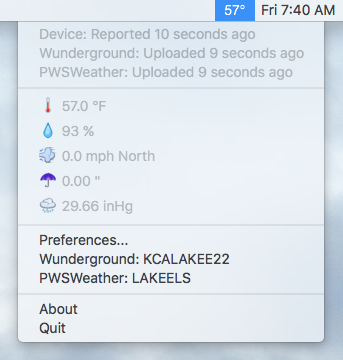 We have also recently added the ability to monitor any Weather Underground station on your Mac. A great feature if you don't have an AcuRite PWS or if you want to monitor your PWS from another Mac. The current version also supports uploading readings to Weather Underground, Weathercloud, PWSWeather, Met Office WOW and CWOP. If you have any questions or need technical support, email us at support@getware.net.